The second of three stealth frigates, the 'Tarkash', is handed over to the Indian Navy by the Yantar Shipyard, Kaliningrad. Russia and India signed a $1.6 billion contract on construction of three modified Krivak III class (also known as Talwar class) guided missile frigates for India in 2006. The first frigate, INS Teg, joined the Indian Navy on April 27. The last in the series of three frigates, Trikand, currently undergoes dock trials and after it completes sea trials in the Baltic Sea will join the Indian Navy in the summer of 2013. 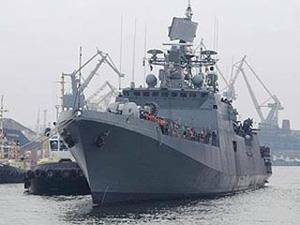 The new frigates are each armed with eight BrahMos supersonic cruise missiles and are also equipped with a 100-mm gun, a Shtil surface-to-air missile system, two Kashtan air-defense gun/missile systems, two twin 533-mm torpedo launchers, and an antisubmarine warfare (ASW) helicopter.